We have 10 years of experience working with both residential and commercial clients, including some well-known hotel and hospitality suites around the Milwaukee Metro area. We pride ourselves on affordable, quality service. Owner, Doug Wright is on every job, start to finish. A-1 Refinishers uses is a Polyurethane top coat that is non-toxic, and has a curing time of 3-10 hours. 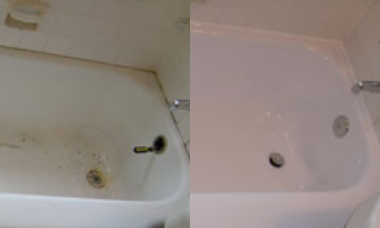 You can use your tub the same day we refinish it. How long does it take to refinish a tub? 2 hours or less if we don’t have to strip off old materials. Stripping a tub adds an extra hour. Does it smell? Yes, but we try our hardest to cut down on the smell by opening the window in the bathroom if there’s one, and covering gaps under the door. How long will the new coat last? If care instructions are followed your new coat will last 10 plus years. Care instructions are provided when the job is complete. How many colors are offered? We can match any color with a sample of the color from the either the customer or the existing tub, or to match a sink, etc. Is the surface hard to clean? No, not at all. The care instructions list safe cleaners to use. What happens if the coat doesn’t hold for some reason? We will repair it for Free! We have very little call back for repairs. Is the Material toxic? No, not at all. Toxic materials are illegal to spray in residential Properties. Do we have to wait 48 hours to use the tub? NO. The tub can be used same day.